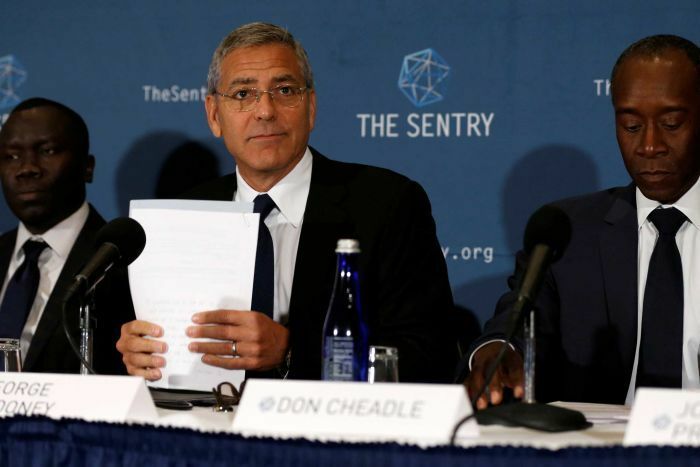 In case you didn't already know (and chances are, you didn't), last year George Clooney and human rights activist John Prendergast co-founded The Sentry, an initiative tasked with disabling the operations of African war profiteers. Clooney might be most well known as an actor, but he's an immensely politically active human rights campaigner too, having been heavily involved in the opposition to the Darfur conflict (which got him arrested for civil disobedience) and he organised the Hope for Haiti Now telethon in 2010, to name a few. In this case, the current focus is on Sudan, and this is where it gets really interesting. During a press conference on Monday, the group revealed that they've been using Facebook and Instagram to gather information about how Sudanese leaders have been spending the money gained from the vice-like grip they've had on most of the nation's resources during the current civil war, which has been raging for 3 years. The group found images on both platforms of people closely connected to both the President of South Sudan, Salva Kiir Mayardit, and his rival Reik Machar, posing surrounding by affluence and, in some cases, stacks of money. Connect this information to the chains of arms dealers, crooked lawyers and bankers and the picture becomes inescapably clear. Kiir has a 12-year-old son, who himself has a 25% stake in a holding company, to say nothing of his other six children and his wife, many of whom can be seen in the images examined. The companies they're connected to range from mining to gambling to aviation to, wouldn't you know it, military arms. There's also Lawrence Mual Malong, a known cohort of Kirr's who calls himself a 'Young Tycoon' and features in reams of pictures with sports cars, flying first class and wearing ridiculous clothes. It might seem arbitrary to examine the behaviour of spoiled individuals like this, but it allows The Sentry to trace the route of the money gained from pitting militias against each other, perpetuating the conflict, mass rapes and all the other atrocities still blighting South Sudan. Coupled with this is evidence of foreign firms paying huge sums of money into known Sudanese bank accounts, which, again, goes hand in hand with the photographic evidence pulled from Facebook and Instagram. The key benefit of this hard evidence is that such firms can now be held to account for their involvement, and hopefully the funding stream can be severed.